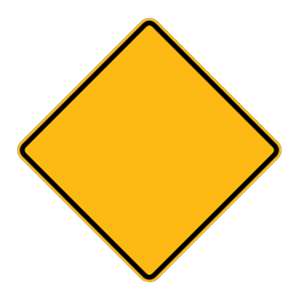 Diamond-shaped signs are used to warn drivers of special conditions or hazards ahead. They are typically yellow or orange in color. Rely on the rearview mirror. Rely on the left side mirror. When changing lanes, glance over your shoulder to check for traffic in your blind spot. You may need to look several times before changing lanes. You must keep track of what traffic is doing in front of you as well as what traffic is doing in the lane next to you. The driver who reaches the intersection first should be given the right-of-way. The driver who reaches the intersection second should be given the right-of-way. The driver to your left should always be given the right-of-way. At a four-way stop, the driver who reaches the intersection first should be given the right-of-way by other drivers. If more than one vehicle arrives to the intersection at the same time, the vehicle on the left should yield the right-of-way to the vehicle on the right. Increase your speed to reach your destination more quickly. 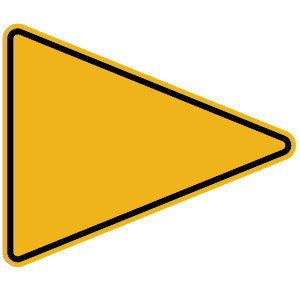 Increase the volume of your radio. Find a safe parking area to take a short nap. When driving, watch for warning signs of fatigue. You are too tired to drive safely if you are struggling to keep your eyes open, drifting from your lane, or turning up the radio and rolling down your windows to keep yourself awake. If you notice these signs, it is a good idea to find a safe place to park so you can refresh yourself with a short nap.